Putrella has grown another 4" and currently stands at 79" (6'7") or 200.7cm. 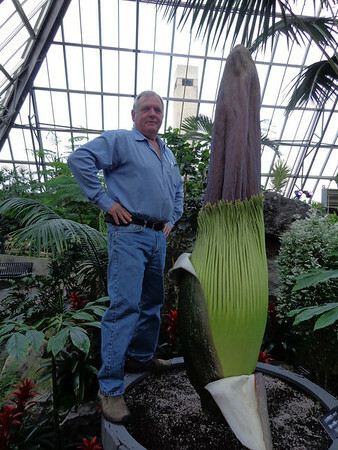 Grower James McIvor inspects the spadix (flower spike) of Putrella, Muttart's giant corpse flower. When the plant is ready for pollinators, this spadix will heat up to 36˚C, emitting the wondrously smelly stench the plant is named for. In its native Sumatra, Indonesia, the plant is known as "bunga bangkai" -- "bunga" means "flower" and "bangkai" means "corpse" or "cadaver".